The official 'Action Day' Press release – 29 October 2010 – is now available on this site. EU policies are boosting renewable energy sources and supporting biomass as a substitute of fossil fuel. While the move towards a decarbonised economy is laudable, an unintended side effect is that it's becoming more profitable to sell wood for energy than for construction or furniture making. Many questions remained unanswered: How will subsidies for biomass affect the market for wood, and ultimately the environment? 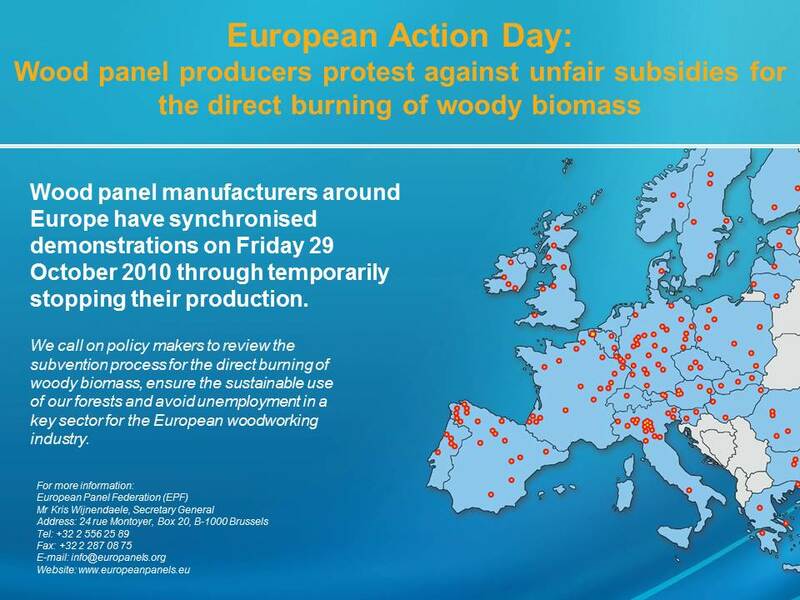 What effect will this have on the European wood industry, jobs and government revenues? 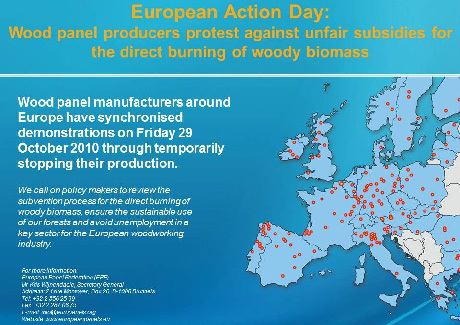 The European Wood-Based Panel industry wants to give a heads up and has asked its members all over Europe to engage in local actions, aiming to raise public awareness. Please revert to the attached business and environmental fact sheets. Please continue to monitor this page, as more details will be put on line in the course of the next weeks. Now available on this site, under section 'Audiovisual': pictures of the event held on 11 October 2010 in the Flemish Parliament in Brussels, a project movie created by artist Arne Quinze and a joint production by EPF/Fedustria, entitled: 'Tackle Climate Change: use Wood'.